When the railroad came through in 1848, it transformed Connecticut's Gold Coast, luring wealthy upper-crust New Yorkers to retreat from the urban crush. The cosmopolitan gentility built their magnificent mansions and suburban paradises in Greenwich, Stamford and Darien. Ornate hotels along the water welcomed American royalty, and resorts beckoned business tycoons for luxurious country weekends. Much of the Gilded Age opulence remains today in areas like Belle Haven, Wallacks Point, Shippan and Long Neck Point. 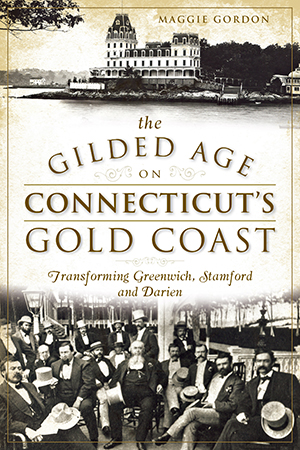 Author Maggie Gordon leads a roaring romp through this most pivotal time and the gilding of lower Fairfield County. Discover the allure the virgin shorelines offered, the pilgrimage out to Connecticut, the architecture and the famous and infamous high-rollers--Rockefeller, Marion, Carnegie, Benedict, Tweed--who occupied the lands. Maggie Gordon graduated from Syracuse University in 2008 with degrees in newspaper journalism and women's studies. She wrote for The Darien News before taking a job at the Stamford Advocate in Stamford as the daily paper's education reporter. Her weekly feature, Trending With Maggie Gordon, runs in the Stamford Advocate, Connecticut Post, Danbury News-Times and Greenwich Time every week. In addition to Trending, Maggie also covers real estate in Greenwich for the Greenwich Time.